Overseas professionals who wish to work in Belgium as employees with an employment contract must hold a Belgium Work Permit. This does not apply to nationals of the Member States of the European Economic Area and Swiss nationals. It’s a renewal permit. If the candidate changes his job (and thus, his employer also changes), the new employer must file a new B permit on the candidate’s behalf. When a candidate has resided and worked in Belgium for at least five years on the same B permit and has had his B permit renewed for four or more times, he can easily obtain an unlimited A permit. Work permit type C is valid for all salaried professions and all employers, for a limited period. It is a non-renewal type of permit issued with only a year’s validity. It entitles the applicant to work for a number of Belgian employers. It is granted to domestic, agricultural and seasonal workers. For candidates who work with a foreign company that offers services to a Belgian firm, a valid copy of employment contract between the Belgian and the foreign companies must be submitted. The Belgian company has to take the responsibility of payment of candidate’s all taxes and social security. Note: The foreign company should not be a recruitment company. Processing time: 15 Calendar Days after application is consider admissible. 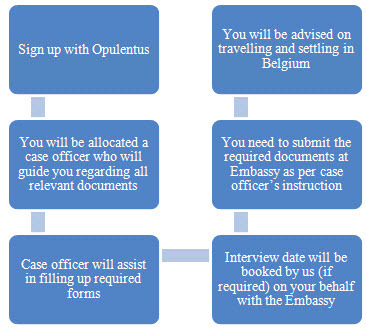 In individual cases, where further scrutiny of the application is needed by the Immigration department in Brussels, the deadline may be extended up to a maximum of 6 months after the application has been considered admissible. Our service fee is Competitive & among the best you will find in the industry. At any given time, our state of the art Processing Centre is processing over 5000 active cases from across the world. Our processes are standard & Process Consultants are the best in the world. Belgium is the founder of European Union. From immigration point of view, Belgium is a beautiful country where one can find great and diverse cultures, linguistic and communities. Belgium has a stable political and economic environment. People of Belgium have a high standard of living and enjoy world class healthcare and education facilities. Belgium has a shortage of IT, Management, Health care and other professionals, thus Belgian government readily accepts immigration applications of highly skilled and experienced professionals.